5. The Divine Right of Kings or Regal Tyranny? Observations on the theory of the divine right of kings and its critics in 17th century England: On the left is the famous frontispiece to Thomas Hobbes, The Leviathan (1651). The book's motto was the Latin "Non est potestas Super Terram quae Comparetur ei" (There is no power on earth to be compared to him). 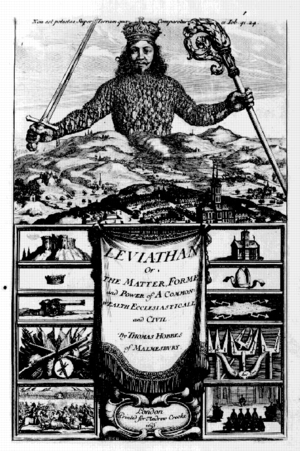 The Leviathan (or the absolute monarch) is wearing a crown and holding a sword (a symbol of military power) and a crosier (of religious power). His body is literally the “body politic” as it is made up of millions of his subjects. He is thus also literally the “head” of state. He stands above the two pillars of his power: the army (the column on the left) and the established church (on the right). From top to bottom, the left shows symbols of the Army (a castle, a crown, cannon, weaponry, and battle); the right shows the corresponding symbols of the Church (a cathedral, a bishop’s mitre, excommunication, logic, and a religious court). There couldn't be a better depiction of the notion of "throne and altar" which formed the basus of state power in the 17th century. The other image comes from the title page of a pamphlet written to defend one of the great opponents of the divine right of kings in England, the "Leveller" John Lilburne. He has been imprisoned for his radical political views and, as so often is the case in these 17th century pamphlets, the author and publisher mock the authorities who are so willing to imprison and censor their opponents. 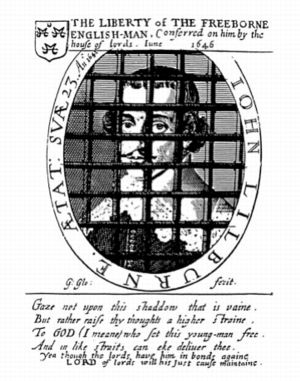 The "liberty" of the "free-borne" Englishman has been taken away (again) by the House of Lords and so Lilburne's likeness is covered in iron bars. The short poem at the bottom states "Gaze not upon this shaddow that is vaine, But rather raise thy thoughts a higher straine, To GOD (I mean) who set this young-man free, And in like straits can eke deliver thee. Yea though the lords have him in bonds againse, LORD of lords will his just cause maintaine." The Levellers were the first group to argue for the natural rights of individuals (especially property), religious toleration, and elected parliaments which were repsonsible to the people. They briefly challenged the divine right of kings to rule before they were crushed by Oliver Cromwell, but their political theory lived on to influence later generations leading up to the American Revolution 140 years later. A Discourse, shewing that all lawfull (approbational) instituted power by God amongst men, is by common agreement, and mutual consent. Which power (in the hands of whomsoever) ought alwayes to be exercised for the good, benefit, and welfare of the Trusters, and never ought other wise to be administered: Which, whensoever it is, it is justly resistable and revokeable; It being against the light of Nature and reason, and the end wherefore God endowed Man with understanding, for any sort or generation of men to give so much power into the hands of any man or men whatsoever, as to enable them to destroy them, or to suffer such a kind of power to be excercised over them, by any man or men, that shal assume it unto himself, either by the sword, or any other kind of way. 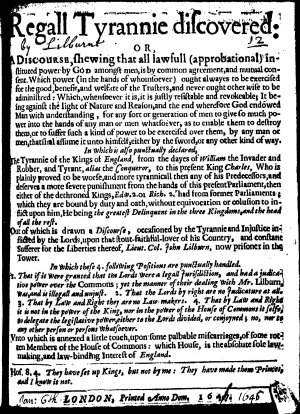 The Tyrannie of the Kings of England, from the dayes of William the Invader and Robber, and Tyrant, alias the Conqueror, to this present King Charles, Who is plainly proved to be worse, and more tyrannicall then any of his Predecessors, and deserves a more severe punishment from the hands of this present Parliament, then either of the dethroned Kings, Edw. 2. or Rich. 2. had from former Parliaments; which they are bound by duty and oath, without equivocation or colusion to inflict upon him, He being the greatest Delinquent in the three Kingdoms, and the head of all the rest. Out of which is drawn a Discourse, occasioned by the Tyrannie and Injustice inflicted by the Lords, upon that stout-faithful-lover of his Country, and constant Sufferer for the Liberties thereof, Lieut. Col. John Lilburn, now prisoner in the Tower. In which these 4. following Positions are punctually handled. 1. That if it were granted that the Lords were a legall jurisdiction, and had a judicative power over the Commons; yet the manner of their dealing with Mr. Lilburn, was, and is illegall and unjust. 2. That the Lords by right are no Judicature at all. 3. That by Law and Right they are no Law makers. 4. That by Law and Right it is not in the power of the king, nor in the power of the House of Commons it selfe, to delegate the legislative power, either to the Lords divided, or conjoyned; no, nor to any other person or persons whatsoever. Vnto which is annexed a little touch, upon some palbable miscarriages, of some rotten Members of the House of Commons: which House, is the absolute sole lawmaking, and law-binding Interest of England. LONDON, Printed Anno Dom. 1647.